You can register your junior golfers ages 7-13 for the Wildwood Green PGA Junior League NOW! Go to pgajrleague.com, search for the Wildwood Green Golf Club team and follow the process all online through the national website. We will have 17-18 occasions for practice and matches this season. The first practice is scheduled for Wednesday, April 3 at 6:45pm at the driving range at Wildwood Green. Registrants should plan on about a one hour practice that evening. Practices will be once a week on Wednesday in April, then Thursday in May and June. Matches will be in the May-June time frame with a final Fun Day event in mid July. Matches are typically held on Saturday afternoon with a start time of 4:00-4:30pm lasting up to 3 hours. We are in a league with UNC Finley and Governors Club and if we get enough registrants we will have two teams. 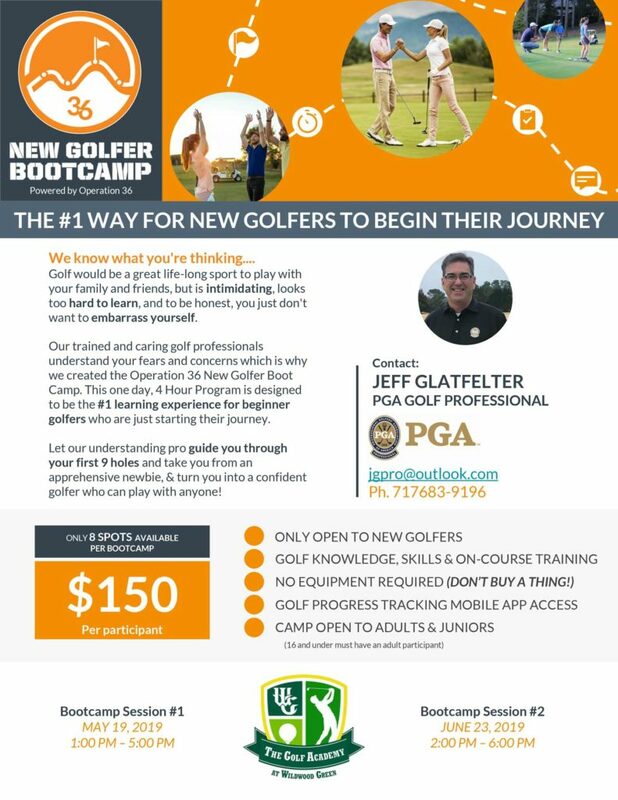 Contact Jimmy Hamilton, PGA at 919-906-1290 with any questions about the program. Class times available for registration at operation36golf.com/#/register/58. Tuition can be made by any major credit card or personal check payable to Jimmy Hamilton by email at hamgolf4u@gmail.com or by phone at 919-906-1290. $430 for 9 weeks classes, 6 on course events and 6 Saturday supervised practice sessions. $520 for 9 weeks classes, 6 on course events and 6 Saturday supervised practice sessions. There is a $30 fee for new families for bag tags and materials due at registration. There is a $40 administrative annual fee due at registration and at the anniversary of participation in the program. The on course events will be the weekends of 3/30,31, 4/13,14, 4/20,21, 4/27,28, 5/4,5, 5/11,12. One day each weekend will be chosen by registrants to play on that day. Tee times will be late afternoons each day. Supervised practice sessions will be 11-12noon on Saturday of the on course events. There will be an information/orientation/registration session on February 16 and March 2 at 5:00pm in the clubhouse at Wildwood Green. You may email Jimmy Hamilton at hamgolf4u@aol.com, hamgolf4u@gmail.com or call 919-906-1290 with questions or to register your junior.